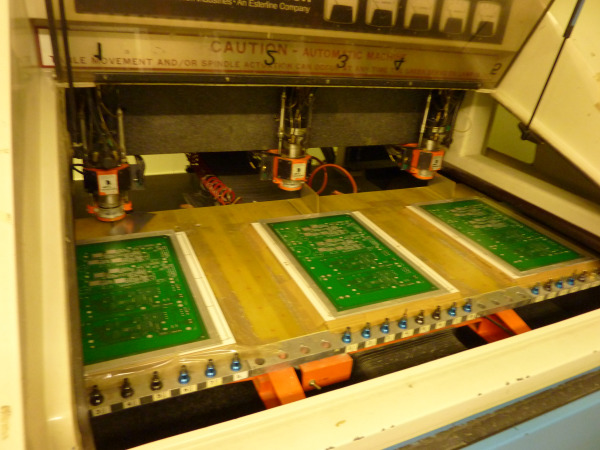 One of the key processes in a PCB manufacturing facility is the CNC Drilling Department. Manufacturing requirements.- to ensure precise registration and to help the operator ensure each drill has successfully completed the tool path. In every business, different personalities are required for specialized tasks. The role of CNC Drill/Route operator requires endless drill measurements and adjustments, constant attention to precise registrations, calculations of tool life, equipment maintenance schedules, as well as constant adaptations for each customer's unique requirements.To be successful, the Drilling Department requires methodical and precise operators who can appreciate the rhythm of the workflow and can hear the music of the machinery. At Omni, we utilize four Excellon CNC Drill/Routing machines which, teamed with our operators, are the real workhorses of our PCB manufacturing process. Mounted on massive granite bases, these 3 ton+ CNC machines are equipped with multiple Air Bearing Spindles capable of 110,000 RPM. Automatic drill changes and high speed positioning allow for up to 30,000 holes per hour. Combined with veteran operators, the precision and output of these machines is unrelenting. A printed circuit board is an unforgiving material. Misread one 0.025” hole requirement from the Job Order as 0.250”and moments later you’ve hogged out a gaping hole in the PCB which is not repairable. Or miscalculate the hits per drill and have a drill bit break due to fatigue and the results are irreparable. Again, it’s why you need the right people in the right role. So how can knowing more about CNC Drill/Routing help you reduce your PCB costs? The quicker your design is in and out of the Drilling Department, the lower your cost will be. When the drill size to PCB thickness ratio goes above 3.9 we need to slow down the machines to ensure tool breakage isn’t an issue and your cost goes up. In addition, the cost increases incrementally when the holes per square inch exceeds 40 as it relates directly to machine time. Your panelization requirements can also increase the complexity and time your panels will spend inside the drilling machines. Understanding these constraints when it comes time for PCB design will help keep your PCB costs under control.